1691: his name appears for the first time in Kyôto theater playbills. 11th lunar month of 1697: premiere at Hayagumo Chôdayû's theater of the drama "Keisei Asama-ga-Dake", which is produced by Yamashita Hanzaemon I; Jinpachi plays the role of Yotarô [casting]. 3rd lunar month of 1699: Jinpachi's rank in the Kyôto hyôbanki, dôkegata section, is jô-jô (superior - superior). 1st lunar month of 1702: Jinpachi plays in Kyôto at Ebisuya Shôdayû's theater in the drama "Ôtô no Miya Kumano Ochi", which is produced by Yamatoya Tôkichi. His others stage partners are Sakurayama Shirosaburô I, Fujikawa Buzaemon I and Kanazawa Goheiji. 11th lunar month of 1710: Buzaemon plays in Kyôto at Ebisuya Shôdayû's theater in the kaomise drama "Inari Chôja Yotsugimaru", which is produced by Yamashita Karumo. His stage partners are Yamashita Kyôemon I, Yoshizawa Ayame I, Fujikawa Buzaemon I and Sawamura Chôjûrô I. 3rd lunar month of 1711: Jinpachi's rank in the Kyôto hyôbanki, dôkegata section, is jô-jô-(shiro)kichi (superior - superior - (white) excellent). 11th lunar month of 1711: Jinpachi plays in Kyôto in the kaomise drama "Kikenjô", which is produced at Hoteiya Umenojô's theater by Sakakiyama Shirotarô I and celebrates the shûmei of Takioka Saburoshirô and Murayama Heijûrô II. 3rd lunar month of 1712: Jinpachi's rank in the Kyôto hyôbanki, dôkegata section, is jô-jô-kichi (superior - superior - excellent). 11th lunar month of 1714: Jinpachi plays the role of Arii Shingo in the kaomise drama "Azuma-zukuri Ôdaidokoro", which is produced at Kameya Kumenojô's theater by Sakakiyama Shirotarô I. 11th lunar month of 1717: Jinpachi plays the role of Ono no Yoshizane in Sakakiyama Kansuke I's kaomise drama "Ômu Gaeshi Momotose Gitsune", which is produced by Sakakiyama Shirotarô I at Hayagumo Chôdayû's theater; his stage partners are Shibazaki Rinzaemon I, Kirinami Takie, Yamada Jinpachi, Bandô Hikosaburô I, Sawamura Otoemon I, Sakakiyama Koshirô I, Katayama Kozaemon, Matsushima Moheiji, Bandô Matajûrô I and Onoe Samon. 11th lunar month of 1718: Jinpachi plays in Kyôto at Hayagumo Chôdayû's theater the role of the kagokaki Jinsuke in the kaomise drama "Chôseiden Kogane no Ishizue", which is produced by Sakakiyama Shirotarô I. 11th lunar month of 1721: Jinpachi plays in Kyôto at Ebisuya Kichirôbê's theater the role of Kingorô in the kaomise drama "Yamato Uta Denju no Tomikura". 1722: Jinpachi falls ill; he retires from the Kabuki world. 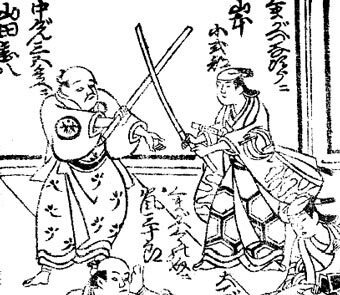 9th lunar month of 1728: Jinpachi dies in Kyôto. Yamada Jinpachi was one of the most important dôkegata in Kabuki history, excelling in fool (ahô) roles like Kaneko Kichizaemon. He was considered as the very first ahô actor in Kabuki. This actor, who had no master and did not train any disciple, was able to make the audience laugh in sad passages of a drama, without spoiling the tragedy and without any form of vulgarity. Unlike Kaneko Kichizaemon, he did not travel and spent all his career in Kyôto. Both actors died the same month the same year.